Educational opportunities abound in the Greater Bangor area. The Bangor School Department serves more than 4,000 students while a handful of private grammar, middle and secondary schools serve hundreds more. Bangor is only 12 miles from the University of Maine and is home to University College, a campus of the University of Maine at Augusta; and Husson University, a growing school known mostly for its business and nursing programs. Students in search of a career in legal technology or secretarial skills can enroll at Beal College, a small college on the city's west side. Those inclined to learn a technical skill or can't commit yet to a four-year degree can enroll at Eastern Maine Community College, formerly Eastern Maine Technical College. Bangor is also home to Bangor Theological Seminary, one of the country's oldest. 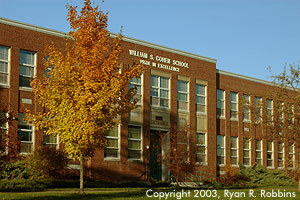 William S. Cohen School serves children in grades six through eight on Bangor's east side. The Bangor School Department serves more than 4,000 students and comprises seven elementary schools, two middle schools, and one high school. Bangor students routinely score higher than the state average on achievement tests. Extracurricular activities for middle school students include boys and girls soccer in the fall, boys and girls basketball in the winter, and baseball for boys and softball for girls in the spring. Bangor High School's fall sports include boys and girls soccer, field hockey, football, golf, and cross country. In the winter, students can choose from ice hockey, basketball, swimming, and indoor track and field. Spring sports include baseball, softball, tennis, and track and field. Bangor High's boys and girls basketball teams have been highly successful throughout the years, and the swim teams have often dominated state competition. The baseball team is one of the most successful teams in all of Maine high school sports history. In addition to sports, Bangor High also offers dozens of clubs, band, the Ram-Page! student newspaper, an annual literary magazine, a math team, a rifle team, theater, debate. The high school offers courses in Spanish, French, and Latin, as well as a Junior ROTC program, creative writing, journalism, and advanced-placement courses. In the last decade, the number of Bangor High seniors advancing to college has increased from 55 percent to 90 percent. A handful of small private schools operate in Bangor. John Bapst Memorial High School, on lower Broadway, is the largest, with more than 450 students. Among the extracurricular activities students at John Bapst can choose from are boys and girls cross country, field hockey, golf, football, and boys and girls soccer in the fall, alpine and nordic skiing, ice hockey, wrestling, and boys and girls basketball in the winter, tennis, baseball and softball in the spring. Bangor Christian Schools, on outer Broadway, have an overall enrollment of 370 students in Grades K-12, with 120 students in Grades 9-12. According to the schools' description, the schools offer a "non-denominational" education in the "evangelical tradition." Students in the middle school and high school grades can play soccer and golf and run cross country in the fall, play basketball or cheerlead in the winter, or play baseball and softball or run track and field in the spring. All Saints Catholic Schools provides students in kindergarten through eighth grade a Catholic-oriented education. Students in pre-school through third grade attend the St. Mary's campus, on Ohio Street, while students in fourth through eighth grade attend the St. John's campus, on State Street. Both campuses offer after-school programs. You can write to the school at info@allsaintsmaine.org. Stevens Hall, University of Maine. 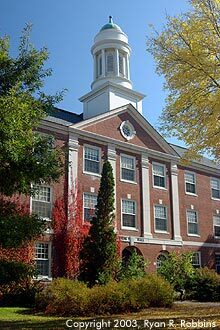 Established in 1865 under the provisions of the Morrill Act, signed into law by President Abraham Lincoln, the University of Maine opened in 1868 as the State College of Agriculture and the Mechanic Arts. In Orono, 12 miles north of Bangor, the school had only 12 students and two faculty members at the time. Its curricula consisted of agriculture, civil engineering, and mechanical engineering. Four years later, the school admitted its first woman student, and in 1897 the school became the University of Maine. UMaine is the state's only land- and sea-grant college. It offers courses in a wide range of fields, from engineering to forestry to agriculture to liberal arts and sciences. The school awarded its first master's degree in 1881 and its first doctorate in 1960. The fall semester begins in early September or late August and ends near Christmas. The spring semester begins in mid-January and ends in early May. In addition, students can enroll in a three-week winter term that lasts during semester break and in the summer session, which runs from May through August. UMaine's enrollment is about 11,000, with about 3,000 students living on campus. The 1,200-acre campus overlooks the Stillwater River and provides students and the general public with miles of bicycle, cross country skiing, and hiking trails. The field house, which at one time was the largest in the United States, provides students with an indoor track and basketball courts, while Harold Alfond Sports Arena offers public skating. The men's ice hockey team has been one of the most dominant teams in NCAA Division I since the late 1980s, winning national championships in 1993 and 1999 and frequently playing before a full house at Alfond Arena, which seats more than 5,200 fans. The arena is also home to the men's and women's basketball teams. Harold Alfond Sports Stadium, adjacent to the arena, is home to the school's football, field hockey, and track and field teams. The school's recreational sports department also uses the stadium and its artificial surface for intramural activities. The nearby Mahaney Diamond is home to the baseball team and seats about 3,000 fans and is considered one of the finest baseball fields in the Northeast. Formerly the University of Maine at Bangor and Bangor Community College, University College became a satellite campus of the University of Maine at Augusta in 1995. With its campus at the former Dow Air Force Base, the school provides associate degrees in liberal studies along with specialties in legal technology, dental hygiene, animal medical technology, human services, health information management, and landscape horticulture. About 1,000 students attend University College, which has 73 faculty members at its 160-acre campus next to Bangor International Airport. Primarily a business school, Husson University is a burgeoning private school of 2,000 students near the outskirts of Bangor. Established in 1898 as the Shaw School of Business in downtown Bangor, the school's current campus is on Husson Avenue, off Broadway. In 1982, the school merged with the Eastern Maine Medical School of Nursing and began offering nursing degrees. The school merged with the New England School of Communications in 1997. 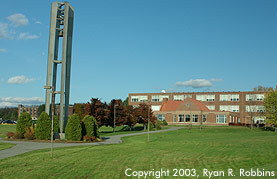 In October 2008, the school changed its name from Husson College to Husson University. In addition to offering business, nursing, and broadcasting degrees, the school also offers programs in occupational therapy, physical therapy, criminal justice, paralegal studies, and physical education. Originally the New England School of Broadcasting, the New England School of Communications is an affiliate of Husson University with classrooms on the Husson campus. It offers a two-year program in broadcast communications, with concentrations in radio, television, multimedia, advertising and public relations, and general communications. 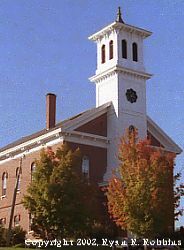 Part of Maine's six-campus community college system, Eastern Maine Community College was established in downtown Bangor in 1966 as Eastern Maine Vocational Technical Institute. Two years later the school moved to its current 72-acre campus on Hogan Road. The school offers one-year certificates and two-year degrees in such areas as mechanical, engineering, and construction industries; nursing; and business. About 500 full-time and 750 part-time students attend the school, which has 50 full-time and 80 adjunct faculty members. The school changed its name from Eastern Maine Technical College on July 1, 2003. Bangor Theological Seminary's old chapel, between Union and Hammond streets. Established in 1814, the Bangor Theological Seminary is one of the oldest in the United States. The school is open to high school and college graduates who want to go into the ministry. The school offers degrees in Master of Divinity, Master of Arts, and Doctor of Ministry. The seminary has a satellite campus in Portland, with the main. The school moved from its 12-acre campus near the middle of Bangor to the Husson University campus in August 2005 because of budget problems. The school had been at its Union Street campus since 1824. A small primarily business school on the Farm Road in Bangor, off upper Main Street, Beal College was founded in 1891. The school offers associate degrees in accounting, medical administrative assisting, office management, and law enforcement. Enrollment at single-building school is about 500 students. The school does not go by a traditional semester calendar. Instead, it uses a mod system, in which courses are always starting in a matter of weeks year round. The Penobscot Job Corps program is one of six in New England and opened in March 1980. Funded by Congress, the Job Corps program provides employment training for people ages 16 through 24. Students live on the 46-acre campus on Union Street and can learn a variety of vocational occupations, such as culinary arts, business clerical, welding, building and apartment management, machine trades, and certified nurses aide. The program is year-round and students can begin their studies at any time. The U.S. Department of Labor's Region I office awarded the Penobscot center a rating of "excellence," the only New England center to receive the rating, in 1996.